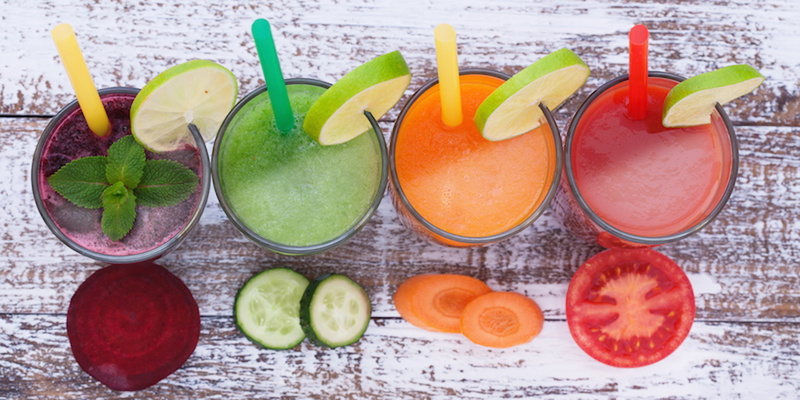 Could drinking your vegetables help you focus better at work? There's only one way to find out! Every once in awhile, a loud hum and whirrr surprise the employees working away at Redbooth’s Redwood City, California office. But someone taking the company juicer for a whirl is just part of the workplace vibe. Redbooth CEO Dan Schoenbaum started the trend when he decided to dabble in juicing. It may sound crazy to only consume juice for a meal, a day, or even longer — but it’s a food trend that’s gained increasing popularity in North America. Juice-cleanse peddling shops have popped up by the dozens. Instagram feeds are cluttered with photos of colorful juices in mason jars, friends clinking glasses of vibrant smoothies and bottles of juice in every color of the rainbow. The Guardian newspaper has even declared that sober is the new drunk as people opt for juice crawls over the traditional bar-hopping alternative. So, why not move that health craze into the office, where it can be hard to remember to bring a healthy lunch five days a week or to resist the temptation of shared baked goods? A marathon runner, Dan loves to unwind with a good glass of wine and a rich meal now and then. He came upon the juice movement while watching a food documentary on Netflix. Fat, Sick & Nearly Dead follows a man who was once, well… fat, sick and nearly dead. In the movie, he transforms his life drinking fresh fruit and vegetable juices and inspires other severely overweight or unwell Americans to make the switch as well. “If you watch that and you aren’t inspired, I would be very surprised,” said Dan. When he’s on a juice kick, the CEO will drink two out of three of his daily meals. Breakfast and lunch are juices, while dinner is the usual fare. He dropped 10 pounds easily on what seemed like an effortless change in his eating habits and got hooked on this fruit- and vegetable-intensive regimen. That’s how the noisy juicer ended up in the office — although, for balance, there’s an espresso machine and a kegerator nearby to compete…sometimes you just need a coffee on a Monday morning! Including more juice in your work routine doesn’t have to be difficult. First, you’ll need a juicer for the office, wherever that may be. If you work from home, you’ll likely just have to buy one yourself. But if you work out of a shared a workspace, maybe you can convince some co-workers to split the cost of an office machine. If you’re lucky, maybe you can even convince your boss to use some petty cash to fund one. They come in all sorts of varieties and prices. They can cost close to $1,000 or even less than $100. Like fitness trackers, there’s likely something to fit most budgets and needs. Oh She Glows is the mastermind behind many, including the classic green monster and its many spin-offs: Anyone fancy a peppermint green patty monster? Other juice-loving bloggers include Back to Her Roots, Veg Kitchen, Simple Green Smoothies, and a whole lot more great finds on Pinterest. Those feeling fancy can always check out Gwyneth Paltrow’s smoothies courtesy of Goop. Though some have estimated the cost of her drinks to be a little, er, unaffordable. The important thing is to figure out what flavors you like and keep those ingredients on hand so you can easily bring them to the office. For Dan, the favorite ingredient is ginger. His preferred juice recipe includes a whole lot of carrots, a touch of ginger, a beet (for that beautiful purple hue) and an apple. Dan likes to limit the fruit in his drinks to consume a bit less sugar, but the apple adds a sweetness he can’t pass up. One of the best parts of everyone trying out different recipes is that there’s usually a little extra juice left over for co-workers to sample. Who knows, it may turn out you’re actually a fan of beets! To get your colleagues on board, you can feature a juice of the week recipe on a corkboard near the juicer and keep the supplies for it on hand at the office. That way, everyone can sample fun new flavors each week. There are a lot of benefits from making fresh juice at home or at work. You’re likely getting closer if not reaching that daily recommended fruit and vegetable intake, which can be difficult to attain. Eating more of these can reduce your risk of heart disease, like a stroke; can protect against some types of cancer; and can lower your likelihood to be obese, according to the USDA. But that doesn’t mean it’s always easy to choosing juice over other options when you get up from your desk. You also have to plan ahead to buy fresh produce, prepare fruits and vegetables and power them through a juicer. It can take about 10 minutes to prepare one drink and that kind of time isn’t always readily available. Until you convince your coworkers that it’s time to get juicing, it’s okay to test the waters with a store-bought variety. Lots of grocery stores and coffee shops now carry fresh-pressed juice. In fact, it’s easier than ever to stock the office fridge with a few pre-made juices for emergency backup. The bottom line: For some people, fresh juices at work help some people feel energized — and get more done. If you think you might be one of them…drink up!